Abby sings about wanting to grow up. 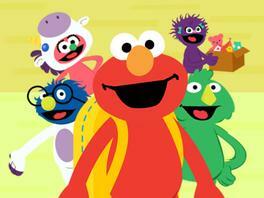 Elmo sings about his butterfly friend. Go on a walk with your child and look for butterflies and other insects like ants, flies, or ladybugs. Notice the differences between different types of bugs! Try drawing a picture of one of them. Let's Hear It For the Grandparents! Let's hear it for the grandparents and celebrate! Big Bird doesn't feel like taking a nap. Follow Tatyana on a day at her school. Gnork asks to play with others. Grover serves the customer some Russian food. Molly shows the class her pet iguana, "Tolstoy." Elmo and Abby can sing anything together. Have your child choose her favorite song and perform it together in front of your family. Try singing the song loud, soft, high, and low! Elmo’s going to school! Help him make new friends and solve problems on his first day. Using puppets or stuffed animals, role play one of the problems in the game with your child, or make up your own. Ask your child what she can do to help. If she has trouble coming up with a solution, give her a few options and have her pick one. Play out the solution together!